The Next Asia is a compilation of 50 essays Stephen Roach's wrote over 2006-07 on not just Asia, but its relevance to the rest of the world. Over the recent years, Stephen Roach's has been one of the most important voices in Asia. For good reason. As Wall Street major Morgan Stanley’s chief economist until recently (in June 2007, he became Chairman of Morgan Stanley Asia), Roach’s work has guided investors, governments, and policymakers around the world. 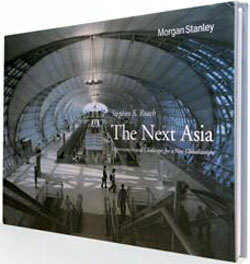 The Next Asia is a compilation of 50 essays he wrote over 2006-07 on not just Asia, but its relevance to the rest of the world. “My basic premise,” writes Roach, “is that the ‘Asia Factor’ is not a static concept—that, it is constantly changing and evolving insofar as its impact on the rest of the world is concerned.” Of particular note is Roach’s view on America’s evolving trade policies versus China. In his Congressional testimony in May this year, Roach was rather blunt with the American policymakers: “You have framed the debate as a legislative response to America’s outsize bilateral trade deficit with China. This point of view is seriously flawed—underscoring the risk of a policy blunder of monumental proportions. By going after China, you in the Congress are playing with fire.” But it’s not just bluntness that marks much of Roach’s work; he’s equally incisive and good at simplifying complicated economic issues. Finally, besides the Roach name, what adds to the book’s pick-up value is its coffee table design.